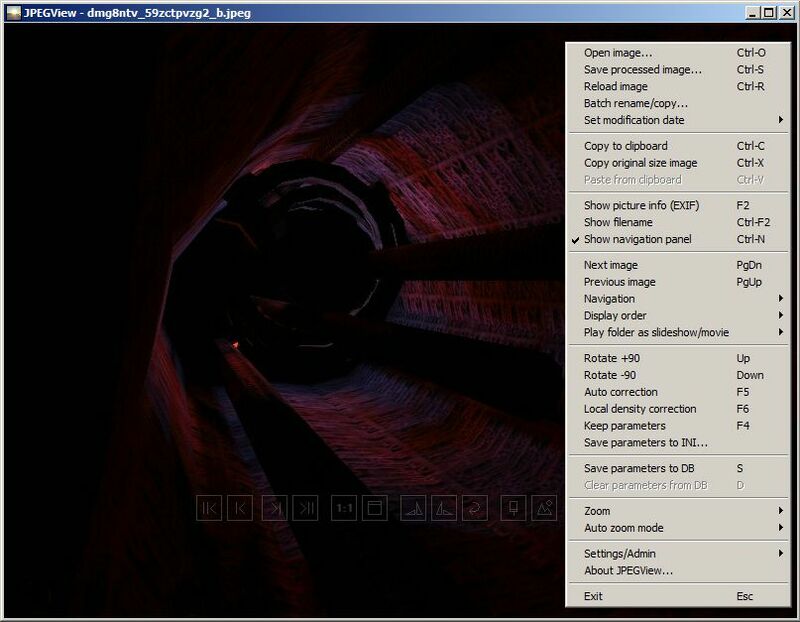 JPEGView is a minimalistic viewer/editor designed to view images from digital cameras full screen and with highest quality possible. Basic image editing functionality is provided, allowing correction for typical problems as color cast, high/low contrast, orientation and under- or overexposure very quickly and interactively during review of the images. The program can view and save JPEG, BMP, PNG, GIF, TIFF, or WEBP. Includes batch rename and copy features. While JPEGView is not intended as a replacement for a full-blown image editor, the included tool set of commonly-used modifications means such editors should be needed less often. A 64-bit version is available (within the folder). Alternatively, JPEGView Portable is also available from PortableApps. You can also use something like eXpresso, which has the benefit of being global and singular. I agree with the positive comments. I scanned all my ancient negatives and slides to huge tif files. This is the only viewer that opens these full screen instantly on my machine. Other progs have more functionality, and I have those, but as a graphics viewer on a Windows box, this is unrivalled. where "C:\\Portables\\Graphics\\JPEGView64\\JPEGView.exe" is your path to the exe. Needless to say, this program is drastically better than the included image viewer for Win10. This viewer has been my default graphics editor for over ~3 years now. Very fast, lightweight, and minimalistic. I recommend cycling through the included INI file for additional available settings and tweaks. Great program for quick viewing; currently my default. If someone's looking for a similar program with much more functionality/info, try out Faststone Viewer. It opens tons of fomats (incl RAW) fullscreen on a black background, and moving the mouse to either corner of the screen gives handy popup windows for metadata, editing, browsing, etc. I switched to JPEGView because you can quickly go from fullscreen to borderless window, as well as quickly zoom the window in and out, which is handy when doing graphic work with reference images. Just tried the update. The support for animated GIFs was a welcome addition, because up until now I had to open GIFs in another program to view the animations. This app just keeps getting better! @turionaltec: Actually, anything is quicker than Windows photo viewer, but yes, JPEGView is a great app, and incredibly versatile for its size. Every once in a while you come across a program that you think might change your life. This is one. I set it as my default Jpg viewer. A lot quicker than Windows photo viewer, automatically displays full screen photo (=bigger pictures when browsing), and honours EXIF rotate tags. Wish I had it 10 years ago. JPEGView will open GIFs when you use the file open dialog, but I set it up as a default application in Windows itself (right-click a GIF file in Explorer, etc.). UserCmd3="KeyCode: X Cmd: 'C:\Users\MyName\Documents\Apps\XnView\XnView.exe %filename%'"
So if I press X while viewing a GIF in JPEGView, the image will open in XnView (without closing JPEGView). UserCmd4="KeyCode: Y Cmd: 'C:\Users\MyName\Documents\Apps\StylePix\StylePix.exe %filename%'"
As you can see, I keep all my programs in My Documents, which makes them much easier for me to manage, esp. because they don't require installers. Once you've read the help file and learned the keyboard shortcuts, etc., JPEGViewer is amazingly fast and flexible. I've now set it up as my default viewer for all the image formats I use. It will not play animated GIFs, but I simply get JPEGView to open the GIF file in XnView if the image is of the animated type. Meks: The 'Save to' button on the panel only saves the processing parameters to JPEGViews internal parameter DB. It's not touching the pixel data of your image. With the 'Remove from' button it's possible to delete the database entry and you will see the image as before. JPEGView doesn't seem to remember the last used directory after I reboot. Is this a bug? or have I overlooked a setting in the .ini file? the fastest jpeg viewer, the best! Interesting tool, good looks & good functionality - BUT: It lacks a "save as" button, so, be careful when saving. Best copy the original before editing.